Let’s start with Toys R Us and toy-hunting. I enjoyed playing with 80s G.I. Joes and 90s X-Men toys in my youth, became re-acquainted with collecting in my teens, and have since found a legitimate purpose for buying seemingly useless plastic with the LEGO sets and minifigures working well as props for “The Story.” It’s still a children’s market, even though plenty of adults collect action figures. Maybe that’s why I occasionally feel embarrassed toy-hunting? With this store closing, everyone’s there to either get in some final memories of their childhood toy store or get some last minute deals. I went for both. There’s no need for awkwardness. Same with any situation, really. There’s no need to feel awkward walking into any aisle. I could be there looking for gifts. It’s no one else’s business why you’re there. Then let’s expand this thought out beyond consumerism. In most situations, there’s no need to feel awkward just for being anywhere. It’s good to know when you might be standing out. There is value in being inconspicuous. Just don’t pervert it. Your need to stay protected within a crowd should not outweigh the potential rewards of minor embarrassment risks caused by doing anything at all. When you know your purpose on why you’re there, it usually works out better. If you’re listless, you’ll probably be absorbing the scenery too much. You might be thinking about what someone’s doing or thinking too much into what someone might be thinking. That speculation drives me crazy. I think so much about thinking that I can’t do anything besides think. Those anxiety loops can build up to a breaking point. Instead, just focus on what you need to do. Let’s say you need to finish a project that’s due soon. It helps me focus my time when I consider the amount of time I have to complete that task. If I don’t have much time, I’m less interested in procrastinating, and more interested in just getting it done. After all, if you’ve got just one hour to finish writing and editing an essay, you make it count. Similarly, focus your thoughts on positive interactions. If someone’s giving you hassle, try to brush it off. Don’t focus your efforts on them besides shooing them away if they’re a nuisance. Maybe you can briefly consider their input later,if you even remember them. Otherwise, don’t worry about anything that distracts your focus. I’ve found photography is useful for that reason. You steady yourself, focus the camera to get the shot, and then move on. Related: “Lake City Toy Show” and “Cracking the Egg,” among others. 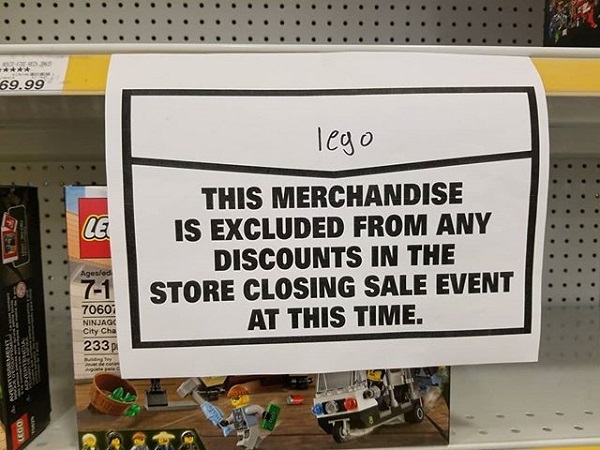 Photo: The LEGO aisle of a Toys R Us store that was closing.